Welcome to Springfield Improvement Association and Archives! Springfield Improvement Association and Archives (SIAA) is the name for the merger of two venerable Springfield neighborhood organizations: The Springfield Improvement Association and Woman's Club (SIAWC, founded in 1904) and the Springfield Heritage Education Center (SHEC). The operations of this combined group are located in the Woman’s Club Building (ca. 1908, at 210 West 7th Street), at the corner of 7th and Silver Streets. Our upstairs Archive rooms are now open for visits, by appointment. As we develop and train volunteer staff, we will also be open for research. Our continuing goals are to collect, compile, and present the history of the Springfield neighborhood in Jacksonville, Florida. 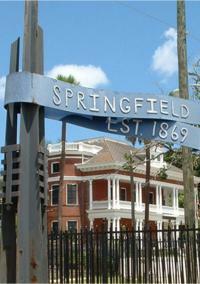 Springfield has a rich history, dating from 1837 to the present. As we develop this website, we invite you to read our blogs, view pictures and videos, read the news, and check out our neighborhood events calendars. To support our efforts, we encourage you to provide a donation to keep the history alive. As we organize our collection, we will also need volunteer assistance, so please use Contact Us to make donations, offers of help, or requests for information. We contine to make progress in website updates and organization of our historical materials. Adam continues his scanning and uploading of our large collection of neighborhood newsletters and Home Tour programs. With additional effort, we hope to have these materials in a searchable format, by date, building address, event, and possibly former resident. All currently available survey forms and photos from the 1985 Springfield Architectural Survey have been scanned and uploaded, and are accessible through our search engine. This works best if you choose Street Address under <Select Type of Search>, type in a street name (ex: 2nd Street), then click on your address from the choices provided. We have been slowly-but-surely replacing missing forms and photos with scanned versions from the Florida Master Site File in Tallahassee. We welcome all suggestions and questions. Please visit us here and on Facebook often to see how we are improving for you!